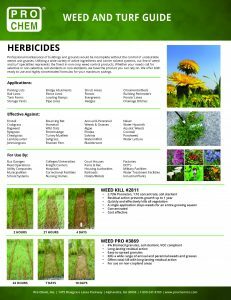 Ureabor | Pro Chem, Inc.
UREABOR is designed for non-selective kill of weeds and grasses with a single treatment. It is specially designed for effective control of perennial grasses such as Johnson grass, Quack grass, Bermuda grass, Dallis grass, and quack grass on industrial sites and non-cropped land. UREABOR has a wide range of efficiency in controlling general vegetation. UREABOR is especially effective in eliminating established vegetation. 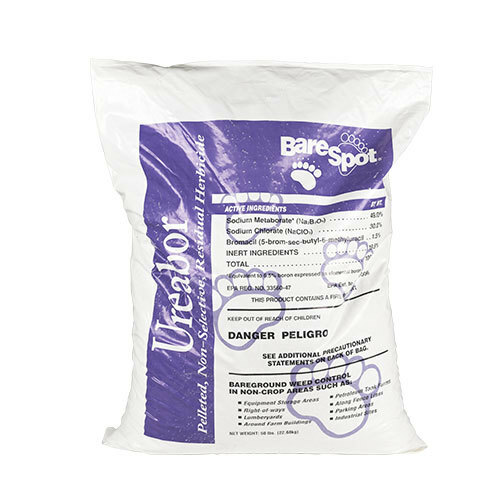 UREABOR provides quick knockdown of weeds and grasses-the bromacil assures long residual control. UREABOR provides control of vegetation for a season or longer. It is packaged in 50-pound, high denier plastic bags. ANNUAL weeds and grasses such as: Sunflower, kochia, Russian thistle, pigweed, crabgrass, downy brome. PERENNIAL weeds and grasses such as; johnsongrass, Bermuda grass, Dallas grass, quackgrass, Canada thistle, field binweed, bluegrass. MIXED annual & perennial weeds and grasses. For all uses, uniform application is essential. The material becomes effective in the soil followed by rainfall or irrigation. Ready to use. Apply with a hand-operated spreader, such as a conventional cyclone-type spreader or a power spreader for larger areas.